Checklist: Is your partner a sociopath? 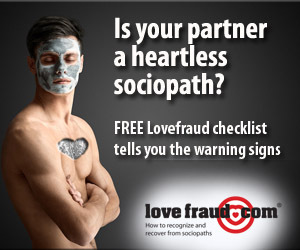 I’ve heard this question so many times that I’ve finally created a quick and easy way to help answer it Lovefraud’s “Is your partner a sociopath?” checklist. The 29 items on the checklist are drawn from the Lovefraud Romantic Partner Survey, which was completed by more than 1,300 respondents in 2012. It identifies the behaviors that people who were in relationships with sociopaths experienced and witnessed, time and time again. These are the same behaviors I continue to hear about from hundreds of readers. So if you are wondering about your partner, I invite you to get the cheat sheet. It’s free, and it’s available only from Lovefraud. I asked this same question, here and on another forum, and I felt that it really did help my recovery and help me go no contact with the sociopath in my life to be able to answer the question – yes, most definitely! So I think this list is great and so helpful to many people. But I also have found myself a year into my recovery reevaluating other close relationships and family relationships and becoming a little too wrapped up in trying to diagnosis someone as a sociopath, narcissist, etc. As if being able to label them gives me an excuse to cut them out of my life, or gives me an explanation for why something they said made me feel bad. I think what I’ve come to realize is that if I’m even asking the question that is a person I need to either go No Contact, or in instances where that’s not possible go Low Contact and keep a check on my boundaries every second I’m with the person. It can be difficult when it’s family or someone you can’t go no contact with, but it’s also a relief to stop asking questions and making excuses for people or wondering if it’s me. If I’m wondering whether they are a sociopath, narcissist, disordered person, then I don’t necessarily need to answer the question or try and diagnosis them myself. The fact I’m wondering or asking the question tells me this is not a safe, loving, stable person and I need to go no contact or at least really shore up my boundaries around them. I only discovered/joined this site today. I am a 59 yr old British psychiatric nurse and childminder (which is supposed to let you know I’m not stupid or nasty). I fell uniquely and deeply in love with my nemesis on my doorstep. I distinctly remember thinking ‘if you take my hand I’ll go anywhere with you – right now.’ This despite the fact I had four children inside, the youngest being 5 months. So, he didn’t seduce me. Anyway, that was all 24 years ago now, and my heart, soul, mind and body have been utterly consumed – and destroyed – by my love for this man. At this time I was a practising hypnoanalyst (yep, he was a client!!) My Bad. So – the poor wounded hero was suffering from vicious attacks on his ego from his second wife. She was obviously unbalanced. I kid you not…..THE VERY NEXT DAY I told my husband I wanted a divorce. I told him I had never realised what love was, but that now I realised it actually existed, I wanted to be alone to discover what life might have to offer. Yeah, ok, I was imagining me and the wounded hero together – BUT we had shared precisely 35 minutes together. In consultation. ANYWAY……this could turn into a frigging novel, so to fast forward to today…I’m in rented accomodation – skint – drinking heavily all hours I have without the kids I childmind. Almost constantly suicidal or at least nihilistic. Praying I don’t wake up, but too guilty to actually kill myself ( I have made a couple of valiant attempts during my time with Sir Galahad – to no avail, obvs!) The Poor Darling has since moved on several times – without EVER relinquishing daily contact – and now is living in someone’s house and using their flat in Berlin and Merc fourwheel monster (I don’t know what it is!). She thinks they’re ‘together’. Poor woman. Christ. What a mess. He just texted me to say ‘Last try. Skype 18.30hrs.’ I know No Contact is my only salvation, but for what?? I am alone. I completely agree with you. At some point is is much more helpful, and probably shows growth, when we listen to ourselves and just let that be enough. Once we know enough, we are the expert in our own lives. I did a lot of ‘rolodex’ cleaning after I understood personality disorders. I got rid of the fully disordered, but also the run of the mill users and abusers. Just found I didn’t need any more negativity in my life. Only kept the folks who were growing and were able to be adults in our relationship. Good for you for understanding this. I really didn’t get this until I was well into my 40’s. But, better late than never!!! I’m so confused on not knowing if my ex was a socialpath or narcissist . We were together for 1year. He told me about his 2 past marriages, . He said he was an abused husband from his last wife. And that she drank and got nasty with him. He had 1 daughter with her and a step daughter which was hers. He has two children from his first marriage. His daughter from that marriage resulted in his daughter being in the states care for life because she has a missing chromosome which makes her want to just eat everything . It’s called wills prader disease . He has a son who he thinks is not his. He wants a DNA done but the boy is 26 now. I told him that’s wrong since he treats the kid as his son. Now about him. He’s 63 years old. Owns his own business. When we were together he would borrow money from me. I always made sure he gave it back. He is a drinker and I think into drugs. He swept me off my feet. He was so charming at first. He told me he wasn’t looking for a commitment. Actually what he wanted was to do what ever he wanted to do at anytime . He was selfish, very optioning , and thoughtless. He lied too. He cheated on me and never respected me or anything I did for him, which was a lot. I watched his dog when he went on a golfing trip for 3 days. And when he went down south to help his step daughter move. I cooked ,sewed, and ironed for him everyday. He cheated on me and that’s why I left him. But then he just totally dismissed me with no explanation. But yet when he sees me with someone he has a fit. He keeps telling me I could do better. Then at other times he tells me he loves me, but he also loves his wife. In fact he brought her a house and a car in the strate she moved to. He goes back and forth there with her . My problem is that I can’t seem to shake this wanting him back feeling. I think of him all the time. I see him and I get butterflies in my stomach. He told my cousin that if he had to chose between me and his wife he would choose me because I have more to offer, but he loves his wife more. He knows how I feel and he keeps telling me that I’m good and he’s bad . He cheated on his wife a lot and that is why she divorced him. But now he says he’s changed and he wants to remarry her. I am so confused and hurt. I am 7 years his senior but look a lot younger. In fact everyone thought he was older then me. Why do I want someone who treated me so badly ? I am a widow for 15 years now and I thought he was my knight in shining armor at first. Can someone try to help me get him out of my head? Patom17 – I am so sorry for your experience. The short answer is that he is likely a sociopath, and you should get him out of your life. The reason this is difficult is because you are addicted to the relationship – with is common when you are involved with a sociopath. They are actually going to attempt mediation in regards to custody of their two young children. My son is actually wanting his children 50 % of the time, even though he was never really there for them before his soon to be ex threw him out. She basically has done all of the child care up to this point and they are 5 and 3. I believe not only does he not want to pay his ex any money, but also wants to still try and control the situation. It’s as if he also has a some sort of need and/or want in that the children make him ‘look good’ if he does this?? Does that make sense at all? He has even asked my husband and I for money for said mediation (which of course, I do not even agree mediation should happen, knowing what I know about SPs, and said no, but he badgered, bullied and guilted my husband into saying yes). Hopefully, the mediator might see through him and sway things the right way. Do I tell the mediator beforehand what (who) she is dealing with, or do I take the chance that she will see him for who he is, and won’t be charmed by him instead?? ?